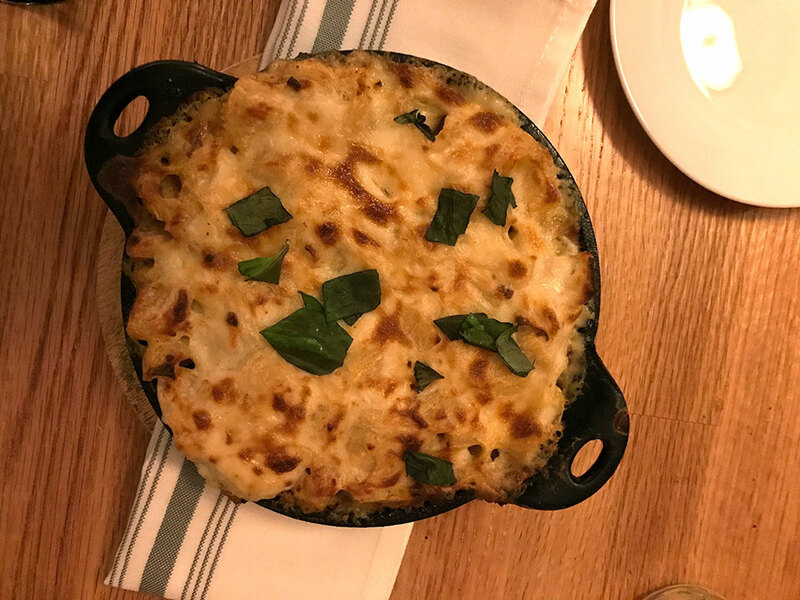 Grano, the latest incarnation of the historic bank building in Chester, is…great! Gone is the austerity of Six Main (although I happened to enjoy their vegan fare) and pains have been taken by a crew of local artisans to make the once uninspired space more lively and fun. It’s a tough room to cozy up with high ceilings and tall, blank windows, but the team at Harvest Moon Design/Build did a fantastic job, and the addition of banquettes was brilliant. 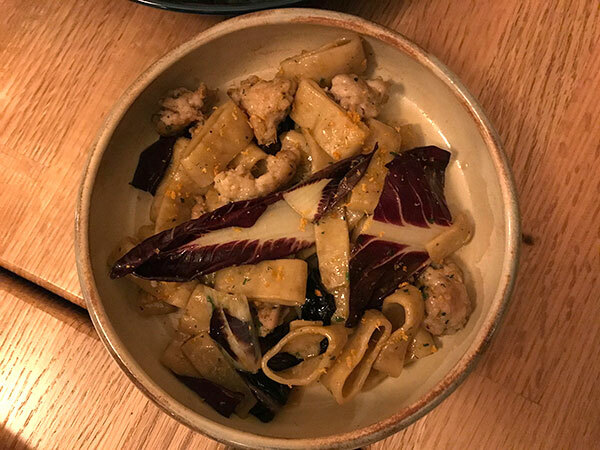 It was a community effort, and the humble chef gives kudos on the menu to the artists involved, down to the ceramicist whose hand-thrown plates you’re considering licking. What could have been a bittersweet evening with close friends moving far away, turned into a slightly raucous dinner party, aided by scrumptious food, copious wine, and the general jovial spirit that pervades the place. Granted, it was packed. 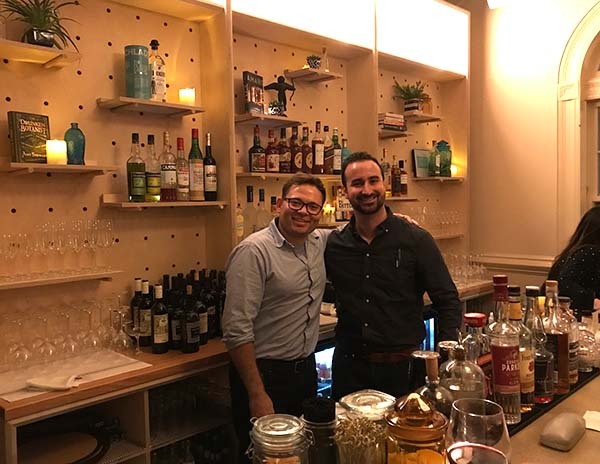 This was Grano’s first night after a series of soft openings and all went smoothly. The staff is skilled (and some faces will be familiar to diners-out on the Shoreline ), and our ridiculously large order came out of the kitchen in well-timed waves. But let’s get down to business. This place is about pasta. Chef Joel Gargano (whom you may recognize from stints on Rocco’s Dinner Party and Chopped) takes the stuff super seriously. Of course, it’s all housemade, but this guy also MILLS the grains! We tried all four unusual varieties on the menu (half portions are available), and it’s hard to pick a favorite, but the Spelt Spaghetti with Stonington Red Shrimp and Broccolini Pesto was flavorful and toothsome. Mac and cheese lovers will be in their sauce with Conchiglie con Bolognese: a steaming casserole of shells, meat sauce, and fonduta. A classic rendition of pillowy potato gnocchi is improved with roasted squashes, and the Calamarata was concocted with rye pasta, almonds, and chicken sausage. You could stop there but don’t. 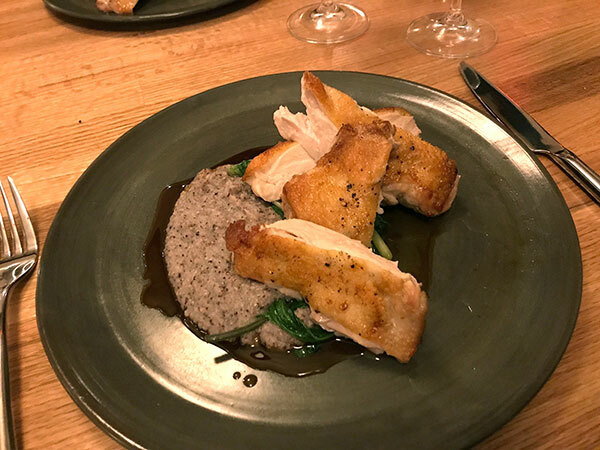 The half roasted chicken in a pool of chunky red flint polenta and braised greens was tender and lovely, and plenty for two. My husband ordered the Niman Ranch strip, which looked awfully good, but I never even got a bite. Next time? The Frutti di Mare: a steaming stew of clams, mussels, pork sausage, and garlic toast. 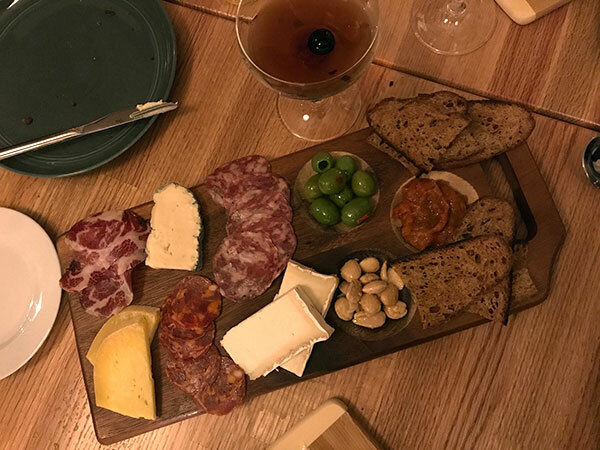 You could easily cobble a meal from the small plates (the salumi and formaggi board with homemade pepper jam!) and a half portion of pasta. Or go whole hog the way we did, down to the intriguing desserts of Quince Crostata with whipped ricotta and salted caramel and Butterscotch Budino with chocolate crumbs and those boozy Amaro cherries (really, who doesn’t like pudding??). It’s a limited but thoughtful menu, with enough choice to please picky and/or fretful eaters. Prices are normal with starters from $8 to $22 (that generous charcuterie board), pastas from $16 – $20, and plates $26 to $34 (the 12 oz NY Strip). 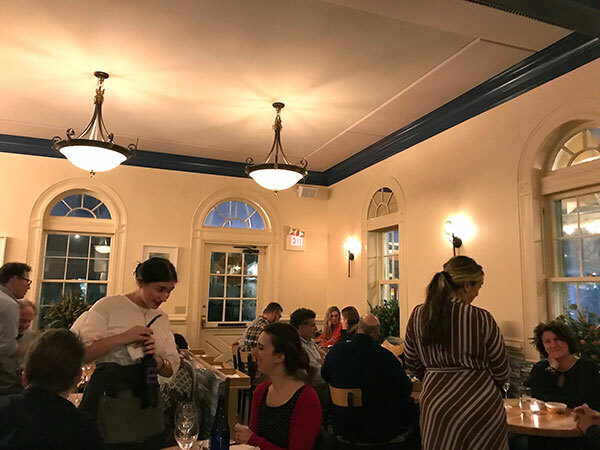 With the recent and sad closing of L&E and Good Elephant, Grano is a welcome and happy addition to the Chester dining scene.